You may remember a year ago I had a serious problem with my Telco [telecommunications company], Telstra. [Read the full story here]. I had had a mobile phone plan with Telstra and been a loyal customer with them for thirty-five years. My issue with them a year ago came about because I had started to receive SMS notifications on my mobile phone about having exceeded my monthly data usage on my plan. The SMS messages were to tell me that they were going to be adding an extra 1GB of data at a $10.00 fee. As I said, I had received a few of these notifications in previous months from time to time, but not so many as to be alarmed. But on this occasion last year I received no less than nineteen of these notifications in about 160 minutes. So I rang them, Telstra, and they informed me that the plan that I’d been on for thirty-four months was a little out dated….and also insufficient in supply…. They, Telstra, also told me that they were providing a better plan now, but they had never called me about it to let me know of its availability. the lady on the phone said. “Here’s what I want you to do. Last week I received an SMS from Optus informing me that my collective [shared] data plan had exceeded its monthly limit, [with fourteen days of the month still remaining], and that extra 1GB lots of data would be added as needed for a fee of $10.00 each. So the first morning, I receive three such notifications that an extra 1GB of data was being added to my account….. I thought to myself that this next fourteen days could become a little expensive. So I phoned Optus to see what I could do. I thought I might need to upgrade to a larger plan. I diarised to check the Optus website close to the time of my renewal being due. I could not believe how seamless and pain free this phone call to Optus had been. My agent was flexible and solution oriented, as opposed to my calls to Telstra a year ago which were aggressively uncompromising and penalty focused. 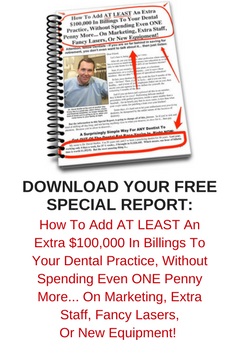 In your dental practice, are you solution focused? Do you look for a resolution that will leave your patients and customers in awe, by providing them with outcomes that they never expected was possible? Why not have your team look at all of the things that could possibly go wrong during your patients’ visits to your dental practice [called Service Defects], and then have them collectively brainstorm all of the best possible outcomes and solutions [called Service Recovery] that they could initiate seamlessly to WOW and amaze your patients. When your patients and customers are left feeling nothing less than special, and are in awe of your processes, then you can truly congratulate yourselves on creating World Class Customer Service Experiences.